A lovely fresh tasting soup with succulent crispy bacon. Wash, peel and chop the vegetables, then place them in a saucepan and cover with the water or chicken stock. Add the thyme and bay leaf. Cook for 15 minutes over a medium heat. Add most of the chestnuts (keep a few back to garnish) and season with salt and pepper. Simmer for a further 30 minutes. Add the cream. Transfer to a blender or use a hand blender to blitz the soup until smooth. While the soup is simmering, preheat the oven to 180°C/350°F/ gas mark 4. Pat the bacon dry, then place between two baking trays to keep it flat and crispy. Cook in the oven for 6 to 8 minutes, until crispy, then chop into small pieces. Add a pinch of nutmeg, if using, and stir it in. 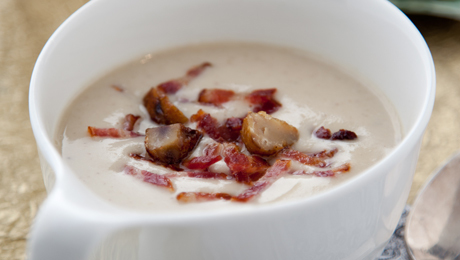 Divide the soup between the bowls, sprinkle with bacon pieces and the reserved chestnuts and serve immediately.